This post is sponsored by for SheSpeaks/Smithfield at Walmart. All opinions are 100% my own. The holiday season is here and you know what that means…holiday parties, family travel, traditional family dinners and so much more! Between the holiday decorations, Christmas shopping, and planning, the holidays can also be a very stressful time. But, it doesn’t have to be. By taking the non-traditional route this holiday season for your family meal can make all the difference in the world. We have done this many years in the past and it’s okay to be non-traditional from time to time. Plenty of people think you have to make the turkey, dressing, and traditional sides at Christmas and Thanksgiving, but the truth is..you don’t have to. 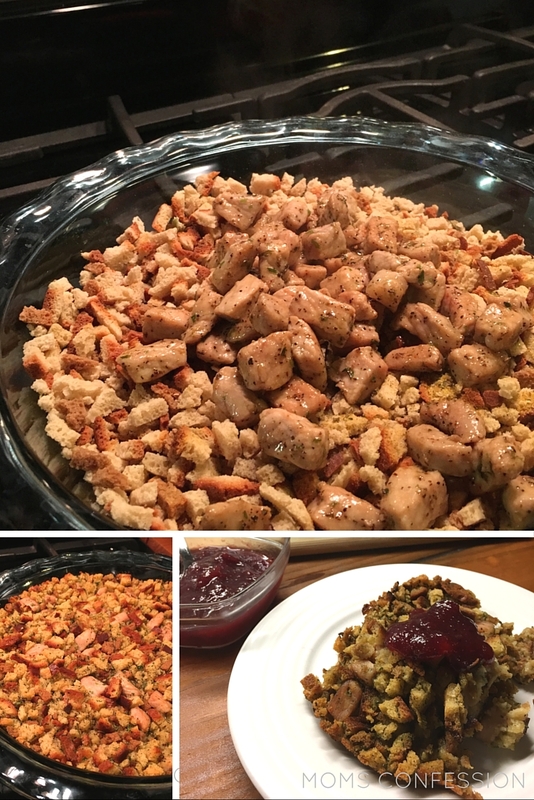 Think outside the box with options like Smithfield Pulled Pork Sandwiches or maybe make a simple pork stuffing (like the recipe I have below). 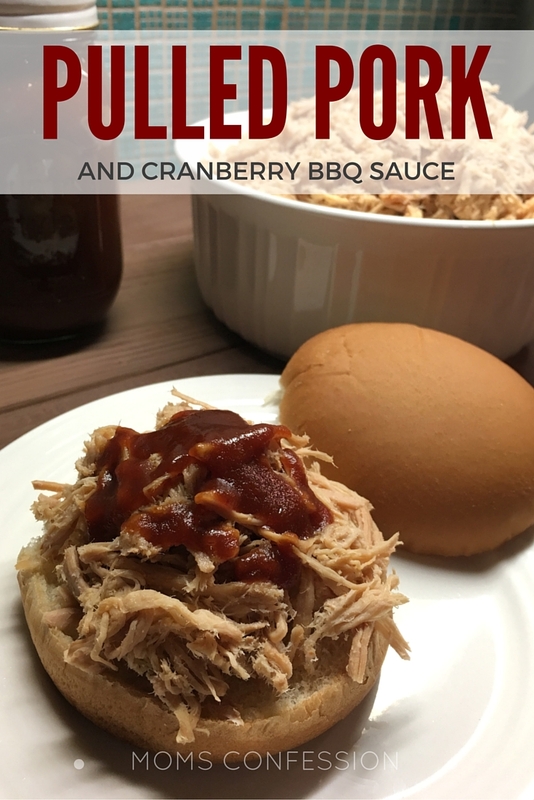 Pork is like the new turkey for Christmas! 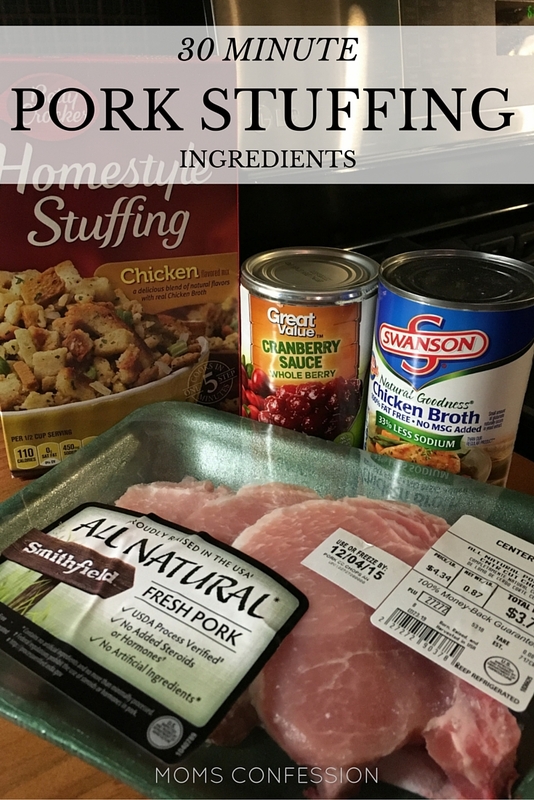 It’s delicious and takes far less time to prep than a traditional turkey dinner. If you wanted to, you could add the traditional sides like green beans, candied yams along with a 15-minute stovetop macaroni and cheese. Honestly, the meal isn’t what makes the holidays so great…it’s about gathering with family and friends to share stories, catch up and share good spirits for the new year ahead. Cut the Smithfield Center Cut Pork Chops from the bone and dice the meat up. Place the diced pork chops into a skillet with garlic basting oil and 1/2 teaspoon of the rubbed sage. 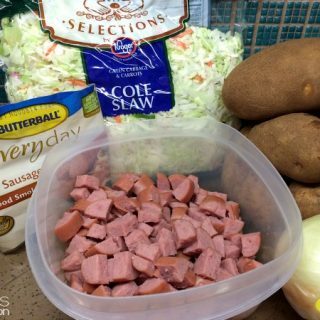 Allow the diced pork chop to cook fully. 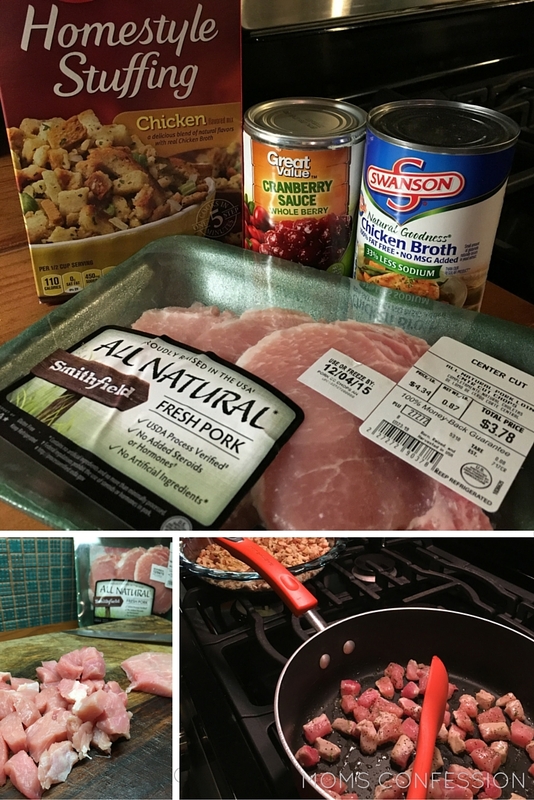 While the diced pork chops are cooking, preheat the oven to 350 degrees. Next, open the dressing box and pour into pie dish. Then, sprinkle the remaining rubbed sage over the dressing mixture in the pie dish. As soon as the dice pork chops are fully cooked, remove from heat and place them on top of the dressing mixture. Next, pour the can of chicken broth over the pork chops and dressing. Then, mix together well. Place the pie dish in the oven and cook for 25 minutes. 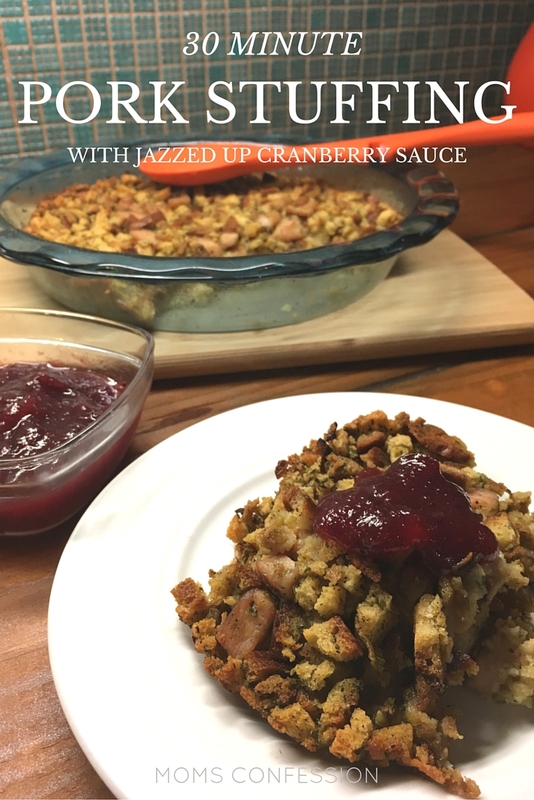 While you are waiting for the pork stuffing to bake, get a medium bowl and mix all the cranberry sauce ingredients together with a whisk until they are blended well and form a thick sauce mixture. 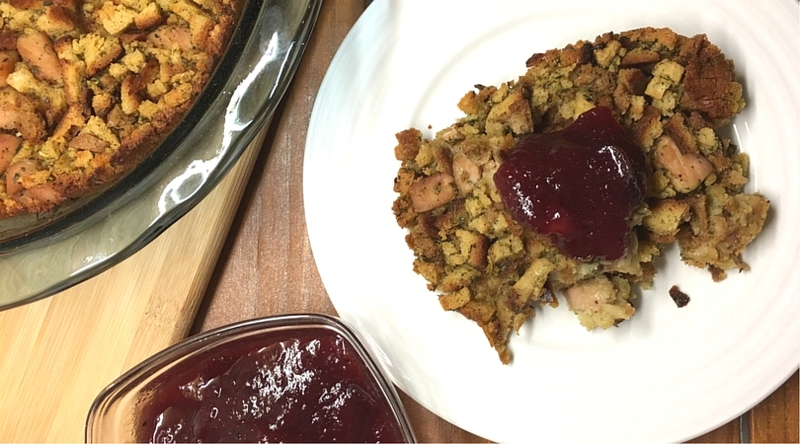 Serve pork chop stuffing with a dollop of jazzed up cranberry sauce.